Posted for: Róisín Corry Roche (Digital Library Intern, Fall 2009). Jack B. Yeats in his twenties, frontispiece, in Arnold, B. (1998). Jack Yeats. New Haven: Yale University Press. Falvey Memorial Library General Collection. This exhibit focuses on the drawings and illustrations of Jack B. Yeats found in Special Collections materials. It also highlights the historical backdrop of Ireland at the turn of the twentieth century, as well as Jack’s involvement with his sister’s publishing company, Cuala Press. In Falvey’s Special Collections, Jack’s drawings are found in children’s book, novels, plays, and broadsides. One of the highlights of the collection is A Broadside. Jack was the editor of the first series and provided over 250 drawings. While a handful of issues are discussed here, the complete first series is available online through the Digital Library. 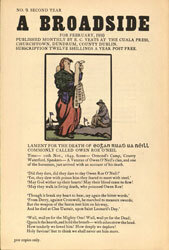 Lament For The Death of Owen Roe O’Neil, February 1910 in Yeats, J. B. A Broadside for… Dublin: The Cuala Press, 1908-1915. Special Collections: McGarrity Collection. As curator of this exhibit I had the rewarding experience of delving into the life of Jack B. Yeats. Prior to my research, my knowledge of the Yeats family was limited to his poet brother, William Butler Yeats, and his artist father John Butler Yeats. I had thought the artist Jack Yeats was the same person as his father. It was a mistake that I came to realize is often made when it comes to the art of Jack Yeats, both during his lifetime and today. Preparing and researching the exhibit was a wonderful experience. Having an undergraduate background in history and graduate degrees in Irish Studies and Library and Information Science, the internship provided me with the unique opportunity of combining skills learned from all fields. The ability to handle rare and old materials on a daily basis was an adventure that can best be likened to being a kid in a candy store. One of the most surprising aspects uncovered during the research phase was the large number of rare materials available in Special Collections. Among the items I was able to use were books signed by well-known Irish authors and rare volumes that are only held by a handful of libraries in the United States. 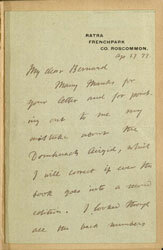 The most exciting moment was uncovering a letter written by a former president of Ireland, Douglas Hyde, taped inside one of his books, The Religious Songs of Connacht. The letter was written to a critic I could only determine to be named Bernard. The review this person wrote is taped inside the back cover of the same book. Hyde, D. (1906). Abhráin Diadha Chúige Connacht (The Religious Songs of Connacht). London: T.F. Unwin. Special Collections: McGarrity Collection. Finding such unique materials on the shelves of Special Collections often made it difficult to stay on task. Despite the temptations, I managed to complete the exhibit in time for the start of the spring semester. I would like to thank Michael Foight, Bente Polites, Joanne Quinn, and David Lacy without whom this project would not have been possible.